A roaded catchment is a water-harvesting structure designed to increase the amount of run-off from the catchment above a receiving farm dam. The ‘roads’ of a roaded catchment are parallel ridges of earth with batters (or side slopes) that cause run-off to be directed into troughs or channels. 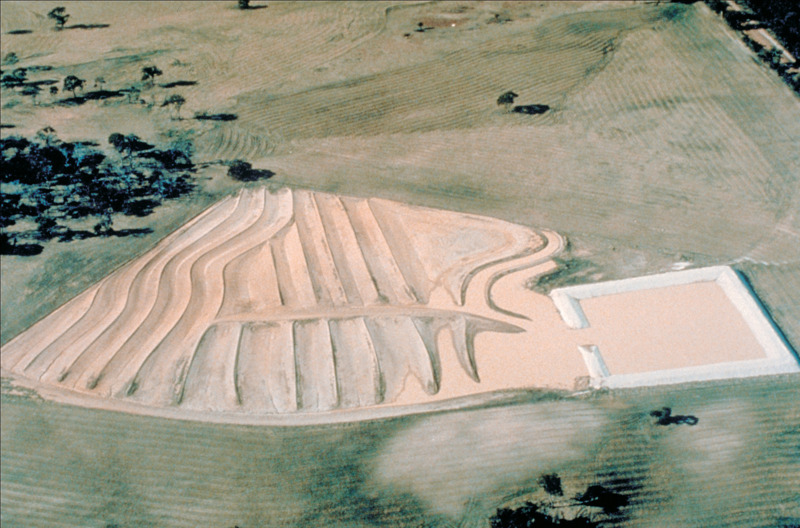 The surface is lined with clay and compacted to make it smooth to reduce infiltration and increase run-off which discharges into a silt trap and then into the dam (excavated earth tank). We recommend that roaded catchments are part of an integrated water and salinity management program. 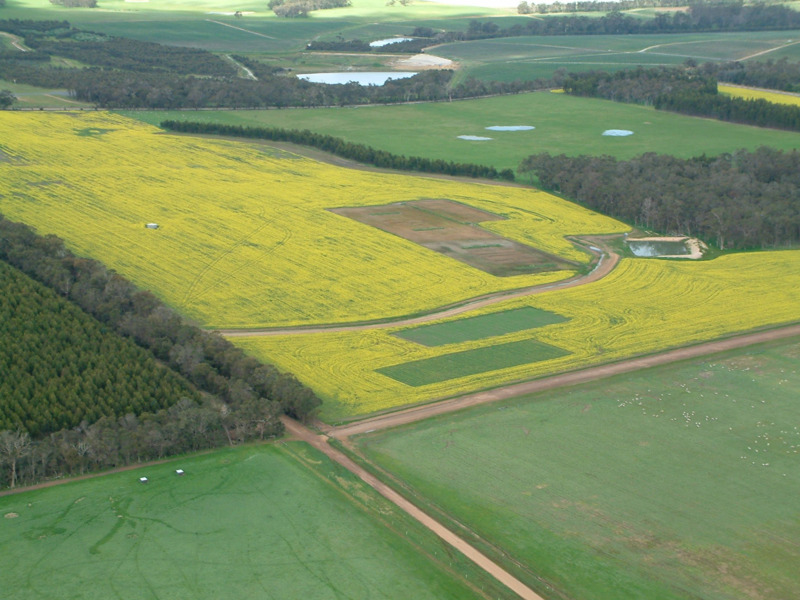 We recommend roaded catchments for all excavated earth tanks (farm dams) in the south-west of Western Australia (WA). The south-west agricultural areas of WA have been drier than normal over the last 10 years, and the projection is for more dry seasons. These conditions increase the need for improved water harvesting into farm dams. Reduced and lighter rainfalls have dramatically reduced run-off from cropped and pasture areas in most of the state, and minimum-tillage cropping increases infiltration and reduces run-off even more. Constructing a roaded catchment for a dam is a cost-effective means of improving the performance and reliability of farm water harvesting. Winter rainfall is often of low intensity in WA, and falls of less than 10 millimetres (mm) per day are common. Continuous rain of up to 50mm is generally needed to cause natural catchments to run water into farm dams. Therefore, building a roaded catchment to run water after only 8 to 10mm of rainfall greatly improves the catchment efficiency. For roaded catchments to work efficiently, good design and careful construction, followed by regular maintenance are very important. Before fitting a roaded catchment to an existing farm dam, assess the dam for place in the property, capacity and leakage. It may be better to build a new and larger dam, silt trap and roaded catchment in the right place. The information here is for Western Australian conditions, particularly the dryland agricultural areas of the south-west. avoid areas of sodic or self-mulching soils. subsoils with a low shrink-swell factor and contain at least 35% clay – hand-texture the soil and allow it to dry to get an indication of the likely shrink-swell characteristics. Many soils in agricultural areas have a sandy or loamy sand surface (often containing ironstone gravel) above a clay subsoil. These soils are normally satisfactory for roaded catchments if the depth to clay is less than 60cm. If the clay material to be used to cover the roads is deeper than 60cm, complete removal of the unsuitable sand or gravel overburden is recommended. In these cases, it may be more economical to use other water harvesting techniques, such as a flat batter dam, or chemical treatments capable of reducing the permeability of the surface and reduces the high cost of removing the overburden. To provide a suitable soil for roaded catchment construction where surface sand and gravel soils contain very little clay (as in parts of the Esperance sandplain, the south coast east of Albany, and West Midland), the surface will need to be covered with a blanket of clay or the topsoil removed. coarse gravel or loose sand that has no clay base. Very plastic soils will shrink and crack as they dry out: avoid these soils because they require more rainfall to generate run-off from the catchment. Strongly structured soils, such as self-mulching clays, are unsuitable because of low run-off. Areas of crab-holes or gilgai should also be avoided because of the swelling and shrinking properties of the clay. reducing the permeability of that sloping surface. You can improve run-off by changing the form and texture of the soil surface to parallel ridges (roads) and channels (troughs), and blanketing these with a compacted clay layer. A grade or slope on the road channel allows the run-off to flow into a collecting channel, or directly into a farm dam. A properly constructed roaded catchment will increase run-off from low intensity rainfall, once the road surface has wetted up to a threshold value. The threshold is defined as the amount of rainfall needed before run-off starts. For example, roof areas have a threshold of less than 2mm of rainfall, bitumen roads begin shedding after 2mm, and farmland can often require 25mm or more before run-off occurs. A threshold value of 8 to 10mm is achievable on most WA grainbelt roaded catchments. We have investigated the performance of roaded catchments since the late 1960s. Results from a property east of York are shown in Table 1 for a catchment with a 4mm threshold. any additional demands placed on the water supply (e.g. pumping for domestic use). Thoroughly investigate the site before designing and constructing a roaded catchment. Survey the extent of the site for the roaded catchment and peg it out. The lower limit of the roaded catchment is determined by providing a safe receiving area or waterway above the farm dam. Assess the soil above the dam for its suitability for roaded catchment construction. To do this, auger holes to a depth of at least 1m, and assess the different soils for water-holding capability. You can estimate soil texture by hand to give an indication of soil strength. Soils with higher strength maintain their compacted shape and will not collapse after becoming saturated. Get a reasonable idea of depth to clay by digging or augering 3 holes per hectare, then using a soil probe to check the depth more frequently on the chosen site. The average depth to clay should be used in working out the design. Areas with shallow topsoil are more cost-effective because road widths can be reduced. We recommend that roaded catchments be fenced to exclude all livestock. Ideally, fence the silt trap and dam also. Sheep and cattle can damage the catchment surfaces, and manure will pollute run-off and the stored water in the dam, and promote weed growth. Roaded catchments, particularly if unfenced, will accumulate sediment composed of plant and animal residues plus soil erosion material, and this material can flow into the dam. Sedimentation reduces the effectiveness of the roaded catchment, increases maintenance costs of the roaded catchment, and decreases the effective depth, storage life and reliability of the dam. We recommend constructing a sediment trap in front of farm dams. The roaded catchment collecting channels should discharge into the sediment trap, which can be easily cleaned out. Sediment in the water can also be removed by channelling it through a vegetative strip or apron before it enters the dam. The vegetative strip could be grass or more substantial plants, such as rushes or reeds. 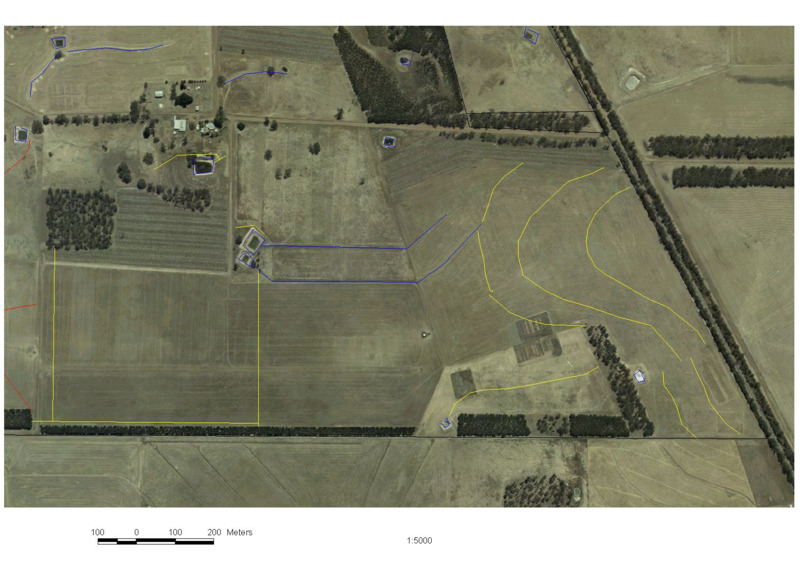 if the dam is located above farm buildings, other farm infrastructure or shire roads. Spillways need to manage overflow during wet winters and large run-off events following heavy rains after summer thunderstorms. They are used to convey the overflow to a safe disposal area and reduce the likelihood of injury to people or damage to the dam, downstream infrastructure or cause erosion downstream. For best results, consult an experienced professional to assist with designing a roaded catchment. Poor design can be costly to correct and result in higher maintenance costs. Most importantly, it will affect the reliability and quality of the farm water supply. 1 On gently sloping ground with slopes of less than 1:80 (1.25%), where the slope is close to that of the design grades of the road channels. The roads are constructed straight up the slope in front of the dam and discharge directly into the front of the dam via a sediment trap. If there are many roads, a collecting channel can be built (see Figure 1). 2 On gentle to moderately sloping ground with slopes from 1:80 (1.25%) to 1:30 (3.5%) and where no stable waterway exists. The roads are constructed diagonally across the slope and discharge into a collecting channel running in the opposite direction (Figure 2). The collecting channel directs run-off to the front of the dam. 3 On moderately to steeply sloping ground with slopes greater than 1:80 and where a stable waterway exists. Roads are constructed across the slope and empty into a grassed waterway leading to the dam (Figure 3). For slopes steeper than 1:30 (3.5%), a grassed waterway must be used because a collecting channel of the required grade would meet road channels at an angle too acute to be conveniently built. minimum erosion or soil removal from the catchment surface. The design must consider the relationship between the depth of the suitable soil material in determining the dimensions crest to trough of the roaded catchment. Where there is soil with a high enough clay content at or close to the surface, road widths and the depth of cut depend on the desired camber of the batters of the roads. On these sites it is essential to bury the topsoil during construction because there are advantages to the landholder, such as easier weed control and lower maintenance costs. On sites where unsuitable sand or gravelly sandy soil overlies clay subsoil, the surface must be covered with excavated clay. A full cover can only be achieved if the depth of cut and road width allow sufficient subsoil to be excavated and if the construction method allows accurate placement. It is essential on sandplain soils (sand or gravel over clay) that the topsoil is fully covered during construction. Roaded catchments built on deep sand require a mantle of clay. This may need to be transported from other locations, and needs to be thick enough to carry out effective maintenance. The recommended thickness of the clay mantle is 75 to 150mm plus. The design and layout of the roads needs to provide low slope batters to ensure that the clay mantle covering the batter has a consistent depth. It is essential that roaded catchments in these situations are fenced to exclude livestock and vehicles. The batters or sideslopes of the individual roads are usually at gradients between 1:5 and 1:6. Road batters around 1:6 or flatter are more stable, effective and easier to construct and maintain, and provide a road surface that is clean and smooth. Sideslopes steeper than 1:5 have been used, but soil erosion is greater and construction is more difficult because of the instability of road rollers. Grades for collecting channels and channels between the roads need adequate slope to allow water to reach the dam without soaking in or causing erosion. The grade will depend on the erosivity of the available clay and the length of the roads. On soils that are likely to erode, the grades should be decreased. Channels with very shallow grades (less than 1:280 or 0.36%) are difficult to make without ponding (ponding results from an uneven grade along the channel). Roads larger than the maximum levels shown in Table 2 could erode even at the minimum gradient of 1:200 or 0.5%. The grade of the road trough or channel must be progressively reduced over its length so that the maximum slope occurs where the water flow is shallowest and the minimum slope is where the depth of water is greatest. The maximum fall allowable is 1:60 (1.67%) for up to 20m, 1:100 (1%) for up to 100m, and 1:200 (0.5%) at 500m for catchments with a crest width of 8 to 20m. The grade at any point on a road depends on the contributing area above it. Table 2 shows suggested maximum grades at various distances from the upstream end of the catchment for 3 road widths. These grades should cause little erosion on most soils provided the roads have been well compacted. Water in collecting channels runs deeper and faster than on sideslopes so the grades must be much shallower to avoid erosion. Collecting channels which may carry large volumes of water must have grades less than 1:250 (0.4%). If this grade is exceeded, the collecting channel may erode. Where the collecting channel has eroded because of excessive grade, it can be stabilised with stone, concrete or bitumen. The collecting channel that picks up run-off from individual roads and directs it into the dam is designed to carry the greatest quantities of water. It must have broad, flat channels and be surveyed on the lowest grade of all, for example, 1:280 (0.36%) and not exceed 1:250 (0.4%) or 1:200 (0.5%) depending on the soil type. The depth of the channels is determined from batter slope (camber), width of roads, thickness of clay cover and depth of topsoil. These are all inter-related in the design of a roaded catchment. Roads must be wide enough and cut deep enough into clay subsoil to provide complete clay cover for the surfaces of the roads (Figure 4). camber or steepness of the batter or sideslope. The depth of overburden and camber of the batters (sideslopes) of the roads are worked out before construction begins. Depth of overburden is found by augering the site at several places. The camber of the batters is determined by soil type and capability of machinery. For a road grader, efficiency reduces when the camber is steeper than 1:5. For any road, there is a minimum thickness of clay cover required on the batters to ensure good water-shedding ability over its whole area. At less than the minimum thickness, some of the rainfall is lost through infiltration, which raises the run-off threshold. For a given depth of overburden and batter camber, the excavated depth of the road trough can be calculated to provide adequate clay cover. This calculation will provide a design width, crest to crest for the roads. The relationship between the depth of channel (trough) and thickness of topsoil is shown in Figure 5. The required depth of cut and road widths can be read from Figures 4 and 5 for any depth to clay. The design dimensions are provided for an average clay cover of either 75 or 150mm, although in practice the clay thickness will vary from point to point. Roads can be 10 to 20m wide from crest-to-crest, depending on the depth to the clay subsoil, and from 100 to 500m long. A collecting channel more than 500m long is less efficient and likely to lose water enroute from the catchment to the dam. Channels should have a parabolic cross-section and sufficient capacity to safely handle large volumes of water. Several roads are usually required. Roaded catchments with a greater distance between roads are constructed more easily and require less maintenance because a deeper clay cover can be achieved. The lower limit of the catchment is defined by surveying the lowest collecting channel that can safely deliver water to the dam. The grades for different parts of the road can be determined from Table 2 and the line of the first road surveyed and pegged. The next road is then pegged at the required distance from the first. The grade of this second road is checked, and if it is within the required limits, the process is repeated until the required area of catchment has been pegged. If any road pegged after the first is outside the limit of grade, a new alignment at the correct grade is surveyed several road widths from the last satisfactory road. Intervening roads are then made parallel to this survey. The layout should be adjusted to minimise areas that are not used for roading. Survey at the discharge end of each road to avoid ponding. If channels are to discharge onto undisturbed ground, the end of each channel should be turned downslope to compensate for the depth of cut going from, for example, 0.3m to 0m at the discharge point at ground level. In this way, a continuous gradient can be achieved. If the water discharges into a grassed waterway, no collecting channel is cut, but the bottom of the U-shaped channels should gradually be tapered up to ground level. Avoid ripping up the pasture cover on the grassed waterway. Alternatively, if road channels are to discharge into a collecting channel of similar depth of cut, no adjustment to the survey will be required. To prevent water ponding at the outlet to the dam, or stored water from the dam extending over the catchment surface, road channels should not be cut below the full level of the dam (see Figure 1). If a collecting channel is used, it is pegged before construction, and roads are cut through its line to full depth. When all the roads are complete, the collecting channel is re-surveyed to connect the floors of each road channel at a grade of 1:200 or less. Once the roads have been completed, the collecting channel should be constructed with a fall of 1:200 towards the dam. The bottom of the channel should be cut to the depth of the U-shaped channels between the roads, but no deeper. The level of the road channels and collecting channel must join precisely to allow a smooth transition between them. If the collecting channel is too low, there is a step-down and the road channel will erode, cutting back up the channel and resulting in the deposit of sediment in the collecting channel and the dam. If the collecting channel is too high, there is a step-up, and water will pond behind the step and bank up on the catchment. Ponded water will evaporate and fail to reach the dam, reducing the efficiency of the catchment. The floor of the collecting channel should have a slight fall to one side, ideally with a slope of 1:10 or 1:20. This allows low flows to concentrate into a narrow channel at one side and minimise water losses. The sideslope is such that the depth and velocity of large flows will not cause erosion. The downhill face of the collecting channel should be covered with clay and rolled to provide an additional shedding surface. The preferred machine for construction is a large road grader. A bulldozer or scraper can be used to remove the overburden if the depth to clay is more than 60cm. In some cases, it may be advisable to build a scraped catchment or spread front above the dam. Construction depends on the design and will differ between sites that require a clay blanket and those that do not. The first roads are built on the pegged base lines and others are built on either side of the base lines. The initial passes of the road grader move the topsoil into a windrow to start forming the crest of the road. Clay subsoil should be exposed on either side of this windrow. The topsoil windrow should be rolled to compact it before proceeding. The grader is used to push the topsoil from the centre (trough) to the outside (crest) of the road (well beyond halfway to the ridge crests). If the topsoil is not moved far enough, the overburden will show through in a line at about ground level enabling weeds to grow. Weeds reduce catchment efficiency and create a maintenance problem. This process is continued until a width of clay has been exposed on either side of the road centre. This width needs to be a little larger than half the road width, which ensures that the overburden is pushed well aside and that when clay starts to be moved up the camber, there will be a minimum of mixing. Thus for a road width of 12m, part-way through construction there will be a width of about 8m of exposed clay in its centre. The overburden is then compacted with a roller. The next step is the ripping up of the exposed subsoil clay in floors and grading it up the camber of the roads to completely cover the mound of topsoil on either side of the road centre. The clay is spread in successive layers on the sideslopes. Each layer is then rolled. Grading is continued until the design depth is reached. This ripping and movement of clay up the camber of the roads continues until the calculated trough depth is reached. At this point, the road channel should be a smooth concave shape and the sideslopes covered with a minimum of 75 to 150mm of clay. The roaded catchment must be rolled to provide a smooth compacted surface that will work effectively. This lowers the threshold at which the catchment will generate run-off and enhances its durability. If the surface is not compacted sufficiently, it will trap run-off in small depressions, erosion will result, and a greater catchment area will be needed to fill the dam. Grader hire is usually 5 to 6 times more expensive than roller hire, but not using a roller wastes more time and money than it saves. Multi-wheeled, rubber-tyred rollers are best as they can compact bumpy or broken surfaces and are useful over a wide range of soil moisture. Steel road rollers tend to produce very smooth surfaces, although there may be little compaction of soil between ‘high spots’ and moist soil can stick to the roller. Farm tractors can be used for compaction, but are not as good as machinery designed for the job. Rolling should be done when the overburden is being stockpiled and when the clay cover is being added to the cambers. Compaction aims to provide a smooth, dense surface and it is vital to compact the clay cover by rolling it when moist. The soil must contain sufficient moisture to allow moulding and smoothing of the surface and give adequate support and good traction for the machinery. A soil that can be cultivated to a good tilth contains sufficient moisture for effective compaction. In winter, wet conditions often limit the operation of wheeled machinery, while in summer, watering equipment is not readily available and the soil is normally too dry. For this reason, construction and compaction of roaded catchments is frequently limited to spring and autumn when soil moisture is close to the optimum. To maintain the reliability of the water supply, roaded catchments need regular maintenance. When the threshold increases, run-off is reduced and fewer rainfall events generate run-off. An increase in threshold above the intended design reduces reliability of the water supply, which can be critical in below-average rainfall years. A well-constructed roaded catchment with correctly designed gradients on the roads and a compacted, stable surface of clay that does not readily support plant growth requires little maintenance during the first few years. Eventually, weeds will invade the catchment and sand and silt will accumulate in the troughs, and then maintenance is needed. The accumulation of sediment on the surface of the catchment will increase its threshold, increasing the amount of rainfall needed to cause run-off into the dam. The surface can be restored by removing accumulated sand and silt with a front-end loader. It is then re-worked with a road grader to restore the surface. Compaction using a roller improves its function, provided the material is not too dry. Water erosion, showing as rilling of the catchment batters or sideslopes and gullying in the troughs and collecting channels, can occur after severe storms with heavy rain — especially during summer — or if the catchment has not been correctly designed or built of unsuitable material. If the clay cover is eroded, more permeable material is exposed at the surface allowing weeds to grow. This raises the threshold and catchment efficiency is reduced. The eroded material is washed into the dam causing sedimentation and reducing the dam's effective storage capacity. Using recommended grades and dimensions to construct a roaded catchment will prevent soil erosion in most situations. Where clays are prone to dispersion, the dimensions will need to be altered to control the water erosion. To repair badly eroded roaded catchments, see design characteristics, detailed batter and road specifications, and construction on this page. Weeds growing on roaded catchments can dramatically reduce run-off from the surface by breaking up the compacted soil and increasing infiltration. Weeds raise the catchment threshold by loosening the compacted surface and absorbing a small part of each shower of rain. Most run-off occurs in winter so early control of winter-growing annual weeds is important. Any dry weed residue from the previous year should be burnt before the break of season. Weeds can be controlled by scraping the surface with a road grader or spraying with non-residual contact herbicides when there is no run-off. Residual herbicides can contaminate the run-off water and should not be used. Roaded catchments should be fenced immediately after construction to exclude all livestock. Livestock will damage the catchment surface which will affect the threshold and require more-frequent maintenance. Animal manure encourages weed growth, causes bacterial and organic pollution of run-off and promotes algal growth in dams. The fence should be regarded as permanent and planned to allow access and space for maintenance.